Welcome to Affordable Awnings Company, Southern California's experts in manufacturing and installing custom-made, stylish and long-lasting awnings for homes and businesses. We've been installing beautiful and highly-functional awnings at affordable prices in Riverside County, Orange County, South Bay and Long Beach for over a decade. Affordable Awnings Company's experienced team ensures professional, high quality work with results that are both attractive and reliable. Our A+ rating from the Better Business Bureau and 1,000s of satisfied clients are a testament to our fair rates, excellent work and lasting results. Affordable Awnings Company provides innovative shade and design solutions for any residential or commercial space. Our custom awnings can extend your living or commercial space, beautify your outdoor area, and provide sun protection, cooling comfort and enhanced relaxation out of doors. Our range of awning products includes manual and electric retractable awnings, stationary awnings, window awnings, canopies, cabanas, aluminum wood, patio covers, drop rolls, sunscreens, balcony awnings, outdoor curtains, umbrellas, sail shades and custom graphics. As a full-service awning company, we can help you with any awning project; we offer manufacturing, production, installation, repair and recovering services. Whether you're looking to install a new awning or recover your old one, we always use the highest quality materials, such as powder coated steel frames and Sunbrella fabrics, giving you the best value for your investment. Our Sunbrella fabrics are even covered by a 10-year warranty. We can custom-design your awning, or you can choose from our extensive selection of shapes, sizes and styles. We carry over 100 solid and stripe designs in a range of color combinations. Whatever your shading needs, Affordable Awnings Company has the solution. Our awning specialists have comprehensive knowledge of all aspects of awning production, as well as years of experience working thousands of jobs. They consistently deliver high quality work and superior service at rates that are competitive and affordable--that's why we're called Affordable Awnings Company. Affordable Awnings Company is fully insured, licensed and bonded. Affordable Awnings Company manufactured and installed this custom retractable awning for an Irvine, CA business. 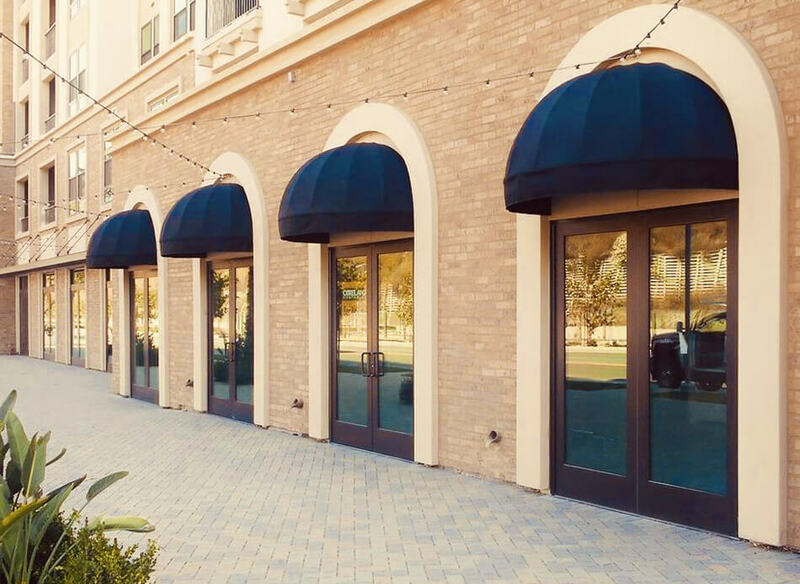 Our commercial awnings are custom made using premium Sunbrella fabric and powder coated aluminum frames to ensure long-lasting, beautiful results. We have over 100 colors and patterns to choose from, and can apply full-color graphics to create an awning that complements your branding. We installed this custom-made fixed fabric awning in Corona, CA for this popular downtown restaurant. The patio awning is made of high-quality Sunbrella fabric and features a black and yellow pattern to complement the restaurant's style while providing shade to customers dining outdoors.